New Mexico’s gambling laws are a wash for poker players. On one hands residents are able to play poker and gamble in the state’s casinos. On the other hand, social gaming is not mentioned, leaving everyone to assume it’s illegal under their general gambling laws. 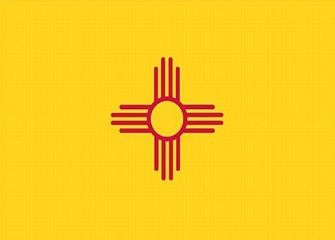 New Mexico is also one of the few states to include online gambling in their statutes, although they only mention it’s illegal on a federal level and appear to be confused as to what the federal laws are anyway. Overall, there are options for poker players. But things could look better. Read on for more details. New Mexico does have laws in place that prohibit online gambling. However, from reading their statute it appears that the state might be confused as to what the UIGEA is. Internet gambling is expressly prohibited by Federal law. This falls under 31 U.S.C.A. §5361, Unlawful Internet Gambling Enforcement Act. The State of New Mexico, and the New Mexico Gaming Control Board do not regulate, license, control or in ANY way sanction, endorse or approve any Internet or on-line gambling, betting activity, wagering or any aspect thereof. Any statement, reference or opinion to the contrary is wrong. Such activity is strictly prohibited and not authorized, approved or sanctioned in any manner by New Mexico regulatory authorities. However, given the wording they used, New Mexico doesn't say they prohibit online gambling -- just that it's prohibited on a federal level due to the UIGEA (which isn't correct) and that they do not endorse it. That said, these statutes are illegal: gambling consists of making a bet, entering a gambling place with the intent to make a bet or playing on a gambling device These could certainly be construed to mean that online poker is illegal, too. B. knowingly permitting a gambling device to be set up for use for the purpose of gambling in a place under his control. A misdemeanor is the punishment for both statutes. Do Casinos in New Mexico Offer Poker? We receive a lot of questions about the legal issues of online poker and gambling in general in New Mexico. We've posted the questions and our answers below. Will online poker be regulated in New Mexico? Considering there are already laws in place about online gambling, we would lean towards a "no." That said, given how close New Mexico is to Nevada, and how Nevada has already regulated intrastate poker, I wouldn't totally rule it out either. Is there an online poker room that accepts players from New Mexico? Residents of New Mexico can sign-up to and play at any poker site that accepts USA poker players. That includes BetOnline, Sportsbetting Poker and Bovada. What other forms of regulated gambling is offered in New Mexico? New Mexico also has pari-mutuel racing, bingo, raffles and a state lottery. Where can I read more about New Mexico poker laws? Here are some interesting facts about poker and gambling in New Mexico. Loses that occur as a result of illegal gambling are recoverable as a debt under New Mexico law. Any person who shall lose any money or property at any game at cards, or at any gambling device, may recover the same by action of debt, if money; if property, by action of trover, replevin or detinue. Poker Alice once dealt at the casinos in Silver City, New Mexico. She's one of poker's famous women players. When New Mexico minors gamble and lose, their guardians can sue the owner of the location of where the gambling took place. If any minor, servant or apprentice shall lose any money or property in any grocery, store or dramshop by betting at cards, or any other gambling device, or by any other bet, wager or hazard whatever, the father, mother, relations or guardian of such minor, or the master of such apprentice or servant may sue for and recover from the keeper of such grocery, store or dramshop, such money or property or the value thereof, so lost by such minor, apprentice or servant.